My love of insects started with a love of butterflies and moths and though my interests have broadened over the years in the world of invertebrates, Lepidoptera are still my favorite type. Every summer I raise local species of butterflies and moths in a large screen house, all of which are then released back into the wild when they mature. It is one of the most interesting hobbies I have ever experienced and I strongly believe that all children should be influenced to experience it at least once. This is not a guide on how to raise butterflies and moths but a showcase of how interesting and beautiful caterpillars truly are. People quickly attach to the beauty of a butterfly fluttering around their garden but rarely think about where it came from or how it developed. In fact, most people when thinking about caterpillars, envision green worms with legs. This book proves how wrong they are in their perception. To say this book is huge is an understatement. Clocking in at 656 pages, most of which feature full color plates, this book is a bargain at its $55.00 suggested retail price (cheaper on Amazon and you can order it HERE). 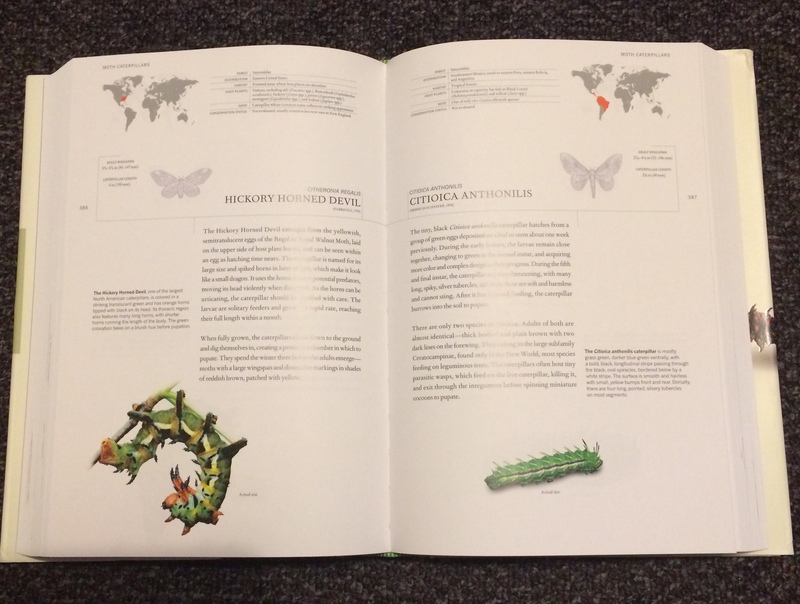 Each page features one species, showing scientific name and common name (when available) as well as the name of the person who first described it. There is also a distribution map and a listing for Family, Distribution, Habitat, Host Plants, additional notes and conservation status. A line drawing is then provided of the adult butterfly or moth with information of the wing-span size. The caterpillar is then shown in full color as well as full size, in its final instar. Then there are two paragraphs describing the caterpillars. This book is really well put together and in my opinion, one of the most exciting books on Lepidoptera to come out in a few years. 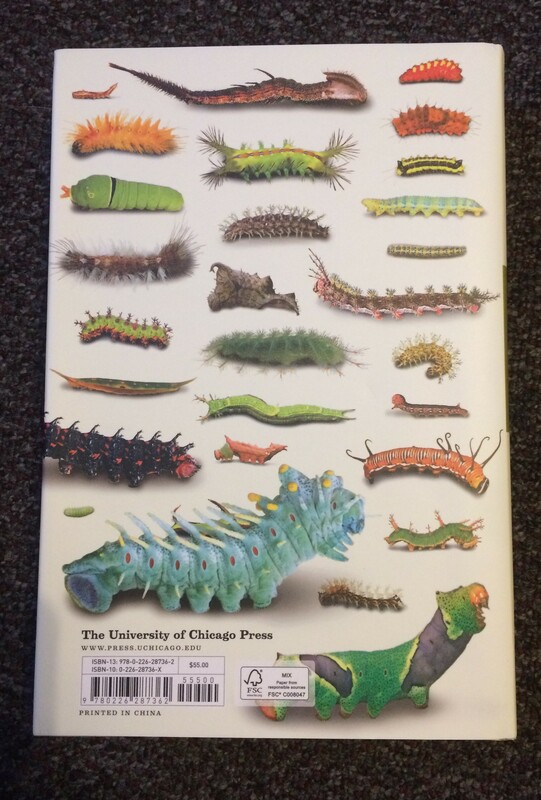 It is well worth the money and should be a part of every entomologist’s library. It is an easy read and fascinating. I actually think it would hold the interest of people with no interest in the subject matter. By showing the caterpillars full-size, you can truly appreciate what amazing animals they are! It is about time that they got the full recognition they deserve! 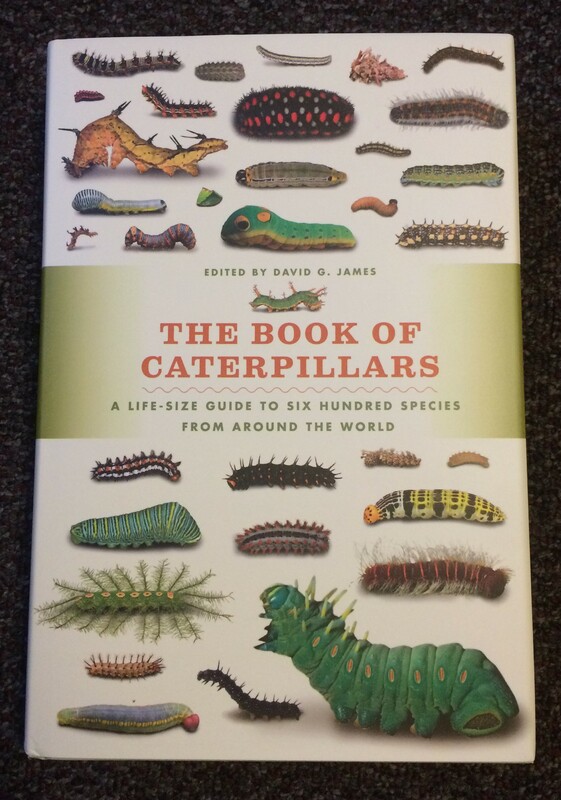 This entry was posted in Book review and tagged Book of Caterpillars, David Albaugh, David G. James. Bookmark the permalink.